Clockwise: Taza’s super spicy chicken broast meal, normal chicken broast meal, and a part of the dining area, and maglouba. In my first two weeks here I had a total no-pork-meat meals. As we should all know, hog meat is not readily available anywhere in UAE. Later on, I was told that Spinneys is licensed to sell halal foods. Nonetheless, those two weeks I stuffed myself mostly by chicken meals from KFC, Popeye’s, Mc Donald’s, interchangeably. The vicious type of meals didn’t include rice and the well-loved Filpino style gravy. I definitely miss the gravy back home. Occasionally I still opt for chicken meals (with the burger, fries, chicken as hot and spicy, or normal: meaning original recipe) when I go out. But sooner I did miss Jollibee’s chicken joy and original recipe of KFC in the Philippines. The best. I was told that there’s Jollibee in Dubai, but I wouldn’t bother to go there (it’s almost 2 hours away from here) just to taste second-rate Filipinized meal. You know, the ingredients are originally not from the Philippines, so expect the Mid East effect on the meals. Until one day, good news came that I tried Taza. Wow, how come I learned about it so late. Its chicken broast tastes better than Jollibee’s and KFC’s chicken! And my homesickness from gravy was taken away by the garlic mayo sauce. While in the Philippines, tasa means “cup”, Taza means “fresh”. It is interesting to note that while the establishment is indian owned, the employees are mostly Filipinos. That makes it a plus reason to come there. It would make you feel like being at home. 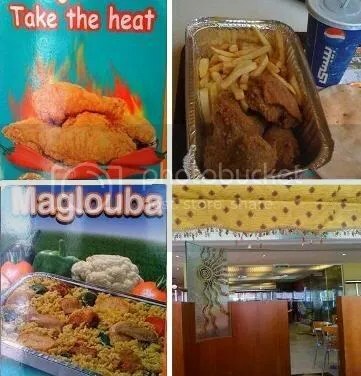 I have not decided yet if I would ever try maglouba (looks so indian) and the super spicy chicken (uberly hot). But for sure, when I am back for a vacation I would be hitting Jollibee in the first 48 hours. today i was there by my self to order cause i heard alot of complaints everytime i send someone to buy lunch or dinner for us …..
even the one in charge there his name is donn or dunn he was watching them and laughing which really makes me so mad and i just paid and i took the food and throw it outside cause i didnt have the ability to eat ………. iam working always in hosbitality and tourism but what i saw in al taa hamdan branch was totaly and profesional custmer service and no attitude at all ………. Hi Mohamed, this post is a food review (on chicken broast) after I’ve dined in Taza-Hamdan Branch. I have been there thrice and I was treated very well. I emphatize with what you had and I think it would be better if you can elevate your complaint/observation to the management itself or at least to the store manager. I am sure they would take action on your issue. Of course, Taza would not want to lose 50 customers who regulary take their lunch and dinner with them. Do you have any idea where I can inquire about franchising Taza? No idea right now. I’ll let you know once I get a reliable feed. Was in ADH nearly the whole 2007. I keep seeing TAZA in Hamdan Rd as I live in TCA along Electra Rd., and whenever I set off to work after clocking at my office in Mashreqbank on my way to Ali & Sons Cars which is exactly across the place. I remember the park in between and the mosque right beside the Taza store (am I right? memory is getting fuzzy now…). Amazingly, I never tried TAZA, didn’t know it taste very good. Missed a great deal. Thought the taste and flavors are intrisic and exclusively Indian, which is too hot for my palate. My question is—-where did you ate at a POPEYE’S? Coz I never saw one when I was there. Had I known one, I would have dug in and stuffed myself. Love them when they were here in Manila. Had a taste of it last Summer 2011 at Singapore and it was such a letdown, chicken taste like a wet carton box. A waste of S$7.50 for a dry meat and a disappointment. Thanks for the info, though. Will try now TAZA once I got back to ADH late this year. There are Popeye’s branches in different malls in Abu Dhabi as well as those branches in Airport Road, etc.